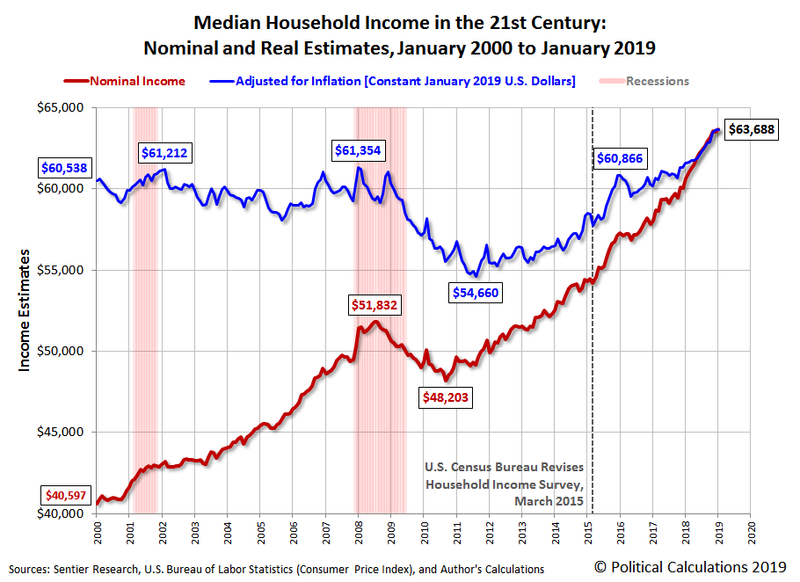 Median household income in the United States rose to $63,688 in January 2019, a 0.3% increase over the Sentier Research's estimate of $63,517 for December 2018. 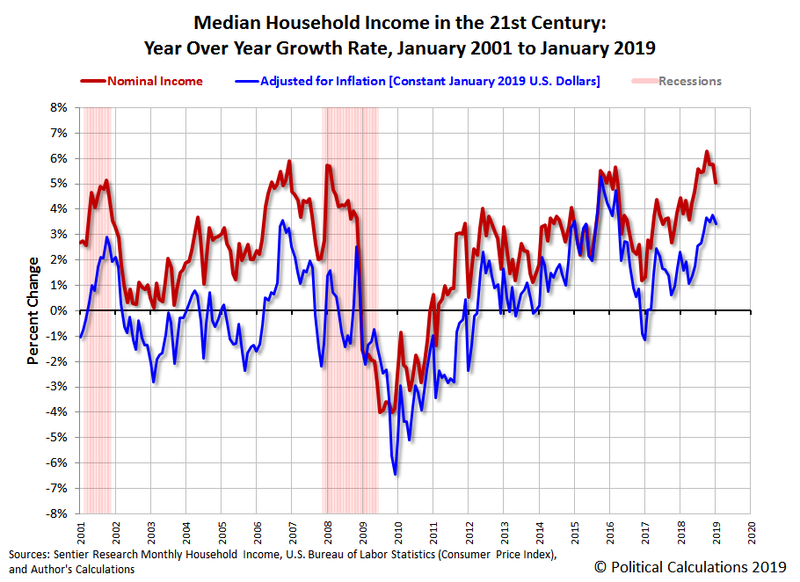 The following chart shows the nominal (red) and inflation-adjusted (blue) trends for median household income in the United States from January 2000 through November 2018. The inflation-adjusted figures are presented in terms of constant January 2019 U.S. dollars. Historically speaking, the nominal growth rate is still well elevated near its recent record high, but it's something to watch as the U.S. economy's exposure to well established adverse headwinds from the global economy increases and the chickens come home to roost from the Fed's rate hikes of 2018. The partial government shutdown earlier in the year has impacted our ability to develop an estimate of median household income using our alternate methodology, where the data we use won't be available until 1 March 2019, assuming the U.S. Bureau of Economic Analysis doesn't change that target date again. In generating inflation-adjusted portion of the Median Household Income in the 21st Century chart and the corresponding year-over-year growth rate chart above, we've used the Consumer Price Index for All Urban Consumers (CPI-U) to adjust the nominal median household income estimates for inflation, so that they are expressed in terms of the U.S. dollars for the month for which we're reporting the newest income data. Disclaimer: Materials that are published by Political Calculations can provide visitors with free information and insights regarding the incentives created by the laws and policies described. However, this article is not designed for the purpose of providing legal, medical or financial advice to individuals. Visitors should not rely upon information on this website as a substitute for personal legal, medical or financial advice. While we make every effort to provide accurate article information, laws can change and inaccuracies happen despite our best efforts. If you have an individual problem, you should seek advice from a licensed professional in your state, i.e., by a competent authority with specialized knowledge who can apply it to the particular circumstances of your case. Ironman is the alias of the blogger at Political Calculations, a site that develops, applies and presents both established and cutting edge theory to the topics of investing, business and economics. We should acknowledge that Ironman is either formerly or currently, and quite possibly, simultaneously employed as some kind of engineer, researcher, analyst, rocket scientist, editor and perhaps as a teacher of some kind or another. The scary thing is that's not even close to being a full list of Ironman's professions and we should potentially acknowledge that Ironman may or may not be one person. We'll leave it to our readers to sort out which Ironman might behind any of the posts that do appear here or comments that appear elsewhere on the web!